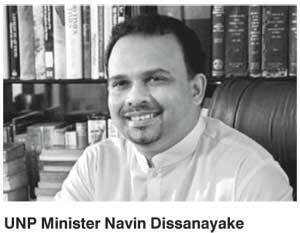 Dismissing speculations of a widening rift between the President and the Prime Minister, UNP Minister Navin Dissanayake yesterday claimed that there were no disagreements that cannot be negotiated. The Plantation Industries Minister insisted that there was no rift between the two political parties in the coalition government, although there are “pressures from party supporters” that have been promised benefits. “We promised 1,800 of our organisers that we will give jobs but, to date, we have not been able to deliver on that promise. Although the UPFA has been giving jobs for 21 years under their government, they too have different demands from their supporters,” he said. Dissanayake also highlighted that members of the Government are now able to express their opinion freely, which he said is a clear contrast to the Rajapaksa regime. “I have been in the cabinets of both governments, so I see the difference. Last week Minister Sajith Premadasa made an emotional statement about the need for more funds for his ministry. I too have spoken emotionally when the funds from this ministry were going to be taken. But this kind of freedom was not there during the Rajapaksa administration. Now I have the space to argue with the Finance Minister. When such discussions happen, they tend to get misinterpreted,” he said. Drawing a number of examples from the history books, Dissanayake insisted that the Government faces no risk of falling apart. The minister also highlighted the benefits of having two power centres within the Government. “This will help put checks and balances in place. We don’t need rubber stamp prime ministers or presidents. We have had that in the past. Both the President and the Prime Minister have a tough challenge before them. They have to manage the interest of the Party. If displeasure within the party grows, it will work against the leaders,” he said.